To Cite: Saleh F, Afnan F, Ara F, Mumu S J, Khan A A. Diabetes Education, Knowledge Improvement, Attitudes and Self-Care Activities Among Patients With Type 2 Diabetes in Bangladesh, Jundishapur J Health Sci. 2017 ; 9(1):e36058. doi: 10.17795/jjhs-36058. Background: Diabetes education provided by physicians in Bangladesh has some limitations, and its impacts on self-management are unclear. These prompted the Diabetic Association of Bangladesh (BADAS) to train 100 diabetes educators to improve the diabetes self-care activities of patients and to pilot the effects of the education. Objectives: In this context, the current study aimed to assess the impact of diabetes education to improve knowledge on and attitudes towards diabetes and self-care activities in patients with type 2 diabetes mellitus (T2DM). Methods: The pretest-posttest study recruited 500 newly-diagnosed patients with T2DM by convenience method from 19 healthcare centers of BADAS. They received a one-hour diabetes education only once at the time of registration to the hospital. A four-part interviewer-administered questionnaire was used to assess the knowledge, attitudes, and self-care activities in the patients with diabetes. The observed changes were compared after 18 months of the intervention and psychological support, in knowledge, attitudes and self-care activities among 458 (91.6%) patients with the mean age of 52.3 ± 11.4 years. 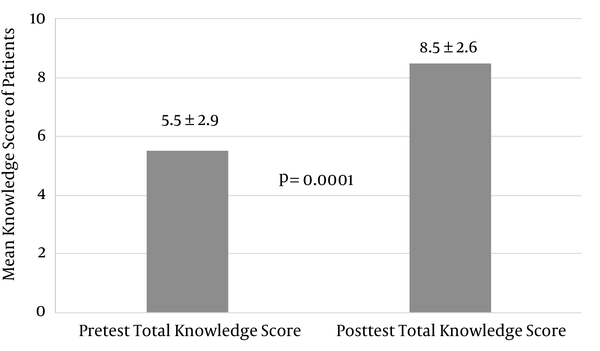 Results: After the intervention, the mean score of knowledge (8.5 ± 2.6 vs. 5.5 ± 2.9) and attitudes (85.7 ± 6.1 vs. 79.9 ± 6.5) of the patients improved significantly (P = 0.0001). About 67.7%, 85.2%, 82.8% and 92.1% of the patients were monitored for blood glucose, doing exercises, taking foot care and smoking withdrawal whereas the rates were 8.3%, 69.2%, 25.8% and 86.7%, respectively before the intervention; a significant difference was observed between the measures. Consumption of betel nuts increased at the posttest compared to that of the pretest (73.4% vs. 70.7%). About 25.5% followed the dietary advice given by dietitians whereas it was only 5.2% at the pretest; there were significant changes between the pretest and posttest measures in this regard (P = 0.0001). One-third of the subjects took meals at a certain time; the number slightly decreased compared to the pretest. Around 36% of the patients weighted food before eating compared to 37.6% at the pretest. There was a significant difference regarding the certain time and weighting food before eating between pretest and posttest measures (P = 0.001). Conclusions: Diabetes education enhances the knowledge of patients and changes their attitudes towards all aspects of DM. It also helps them to improve some aspects of diabetes self-care activities. In line with the economic progress and lifestyle changes in Bangladesh, the number of patients with diabetes increased in recent years. The International Diabetes Federation (IDF) estimated that 5.52% of Bangladesh population had diabetes in 2013 (1). Optimizing diabetes care practices reduces the rate of mortality and diabetes-associated complications; besides proper medication, diet and exercise can delay the development of type 2 diabetes (2, 3). Diabetes-related self-care activities depend on the ability of patient to manage his/her daily life. Evidence shows that the individuals with diabetes often have inadequate knowledge on and nature, risk factors and associated complications which may result in underlying factors (4). If proper guidance and education on diabetes self-management are given, patients are able to improve their lifestyle and maintain good glycemic control. Patients’ knowledge or lack of understanding hinders proper guidance toward the disease. Health education may be effective if the patients’ knowledge, attitudes and practices toward the diabetes are identified. In Bangladesh, repeated re-enforcement of health education and strong motivation are emphasized in the patients with diabetes (5). Results of the conducted studies suggested emphasizing on proper education and awareness programs which should be developed according to the society requirements to improve knowledge of patients and change their attitudes and skills; thereby leading to better control of the disease, as an integral part of comprehensive diabetes care (6-8). In the United States, diabetes self-management education (DSME) with national standard follow-ups is recommended and provided by professional diabetes educators in addition to physicians (9). Diabetes education provided by physicians in Bangladesh has some limitations, and its impact on self-management is unclear. Considering this issue, the Diabetic Association of Bangladesh (BADAS) trained 100 diabetes educators following a well-designed curricula and appropriate training materials and methods. This curriculum was developed based on the International Diabetes Federation (IDF) considering the local culture and context. The present study aimed to assess the effect of diabetes education in knowledge improvement and attitudes towards type 2 diabetes and related self-care activities in the patients. The current pretest-posttest study assessed the impact of diabetes-education programs. The study included 500 patients with newly diagnosed type 2 diabetes, over 25 years old and fasting plasma glucose ≥ 7.0 mmol/L (10). A patient with newly-diagnosed type 2 diabetes is a person with two of the following criteria: a, More than one symptom and sign of diabetes mellitus (DM); b, Fasting plasma glucose ≥ 7.0 mmol/L; c, Random plasma glucose ≥ 11.1 mmol/L measured at least two hours after eating or taking 75 g glucose; c, Diabetic retinopathy; d, Random plasma glucose > 11.1 mmol/L more than once with symptoms (10). The newly-diagnosed patients were selected conveniently on the first day of the study from 19 healthcare centers run by the BADAS; these centers are located in Northern Bangladesh. Patients with other medical complications or unable to answer a short list of simple questions (socio-demographic information such as name, address, disease complications, etc.) were excluded from the study. Patients were interviewed before attending the education session. The enrollment and interviews were carried out from September to October 2009. The minimum required sample-size from each center was calculated using the formula n = 15.4 × p × (1 - q)/w2 (where, n is the required sample-size, p is the expected proportion and w is the width of the confidence interval) (11). The project continued from 2009 to 2011, and the intervention was implemented from November 2009 to April 2011. All the patients (n = 500) attended a one-hour diabetes-education program once during the project period according to a predesigned curriculum. The BADAS policy dictates that each and every newly-diagnosed patient with type 2 diabetes should be asked to attend one diabetes-education session only once on the first day of his/her attendance at the hospital. Four to five diabetes educators conduct the education program for 20 - 25 patients in each center. It was followed by face-to-face and group discussions (using leaflets, a flip-chart and posters) for any problems they were facing; thereby allowing them to freely discuss general management of diabetes. After 18 months, changes in knowledge, attitudes and self-care activities, among 458 (91.6%) patients with type 2 diabetes were observed following the information derived from the same questionnaire. The remaining 42 (8.4%) patients were excluded from the program due to their unwillingness and non-adherence to the self-care activities. A four-part interviewer-administered questionnaire was used to assess the knowledge, attitudes and self-care activities of the patients. The first part of the questionnaire was designed to collect socio-demographic information. The second part included 14 questions on knowledge. The third part that aimed to assess the attitudes of patients contained 20 statements. The fourth part focused on steps taken to monitor blood glucose, control calorie and food intake, physical exercise and foot care practices and also monitor other actions indicating patient’s lifestyle. The diabetes knowledge test (DKT) (12) and the diabetes attitude survey (DAS) questionnaire (13), validated by the University of Michigan, were modified and used to collect data. The DKT and DAS questionnaires were translated into Bangla by two translators. Two separate back-translations were done by native English speakers. The knowledge-related questions were substantively modified based on the guidelines of BADAS (14) to accommodate local culture and food habits of the patients. For example, in the original questionnaire (12), a question on diabetes knowledge test asks: Which of the following foods is the highest in carbohydrate? Baked chicken; Swiss cheese; baked potato; peanut butter. Whereas the authors self-modified questionnaire in Bangla replaced the names of the above diets and expanded to accommodate local dietary habits and guidelines: “Which of the following foods is the highest in carbohydrate? Rice/crevasse/clipped/parched rice; flour route; nodules/sooji/vermicelli; potato/sweet potato; sweet fruits. In the study on dietary advice, a diet was prescribed to treat type 2 diabetes mellitus. A DE/dietitian provided this advice during the diabetes education class. This advice contained limited amount of simple sugars or readily digestible carbohydrates with sufficient amount of proteins, complex carbohydrates, fiber and unsaturated fats similar to the ones recommended for the healthy people. The diet was designed to prevent wide fluctuation in the amount of blood glucose and prevent diabetes complications. Moreover, patients were also advised to take meals in a certain time and weight the food amount before taking meals; weighting food before taking meals was defined as the advice by DE/dietitian to eat a certain amount of carbohydrate, protein and fat on the basis of their disease condition, and make sure that patients follow the DE/dietitian advice to weight the food before eating. A method used in various studies in different countries was adapted to assess the knowledge of patients with type 2 DM (15, 16). Each correct response of DKT was scored 1, while each incorrect response was scored 0. A 5-point Likert scale was used to assess the attitudes of patents towards various items (13). The questionnaire was pretested before its finalization. Based on the 2006 per-capita gross national income (GNI), world bank (WB) calculations the individual income and socioeconomic status of the patients were determined (17) as follows: Low-income (≤ $US905); lower-middle-income (US$ 906 - 3595); upper-middle-income (US$ 3596 - 11115) and high-income: (US$ ≥ 11116). Paired t-test was performed to assess changes in the level of knowledge and attitudes of the patients. Mc Nemar test was performed to find the changes in self-care activities after the intervention. A P-value of ≤ 0.05 was considered significant. Informed written consent was obtained from all the patients after full explanation of the nature, purpose and procedures of the study. Ethical approval was obtained from the ethics and research review committees of the BADAS. The mean age of the patients was 52.3 ± 11.4 years. Of the patients, 88.6% belonged to the middle to upper-middle age-group, and 46.9% to the upper-middle income-group, more than half (55.5%) were female and one-third (33.6%) completed high-school education. The patients from urban areas comprised 72.7% of the patients and nearly half of the patients (47.6%) were housewives. Figure 1 shows the changes in the knowledge score of the patients regarding fundamental components of diabetes management. After the intervention, their mean basic knowledge score was 8.5 ± 2.6, and their mean score on attitudes towards DM was 85.7 ± 6.1 (Figure 2). 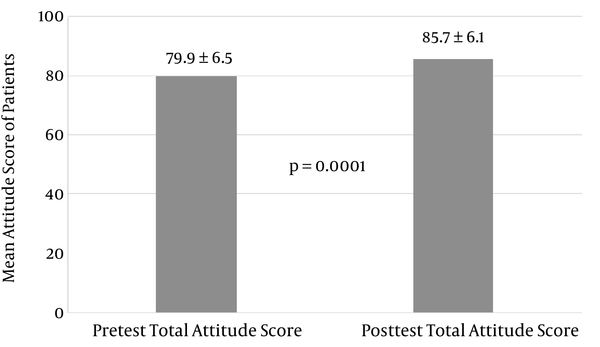 The difference in knowledge and attitude scores between the pretest and posttest was significant (P = 0.0001). Table 1 shows the changes in self-care activities such as monitoring blood glucose, doing physical exercise, practicing foot care, smoking withdrawal and refrain from the consumption of betel nuts. There was a significant difference between the pretest and the posttest practices regarding the self-care activities. After the intervention, 67.7%, 85.2%, 82.8% and 92.1% of the patients monitored their blood glucose, did exercises, practiced foot care and withdrew smoking respectively, compared with 8.3%, 69.2%, 25.8% and 86.7% at the pretest. Consumption of betel nuts increased at the posttest compared to the pretest (73.4% vs. 70.7%). bMcNemar test was performed to evaluate the level of significance; p ≤ 0.05 was considered as the level of significance. After the intervention, 25.5% of the patients followed the dietary advice of the dietitians, which was only 5.2% before the intervention; there was a significant difference between pretest and posttest rates in this regard (P = 0.0001). One-third followed the certain time to take meals; there was a slight decrease compared to the pretest measures in this regard. Around 36% of the patients weighted their food before taking compared to 37.6% at the pretest. The differences in following the certain time and weighting food before taking between pretest and posttest rates were significant (P = 0.001) (Table 2). bMcNemar test was performed to evaluate the level of significance; P ≤0.05 was considered as the level of significance. The blood glucose level of the patients significantly improved after receiving the education [fasting blood glucose (FBG) 8.2 ± 3.2 vs. 9.7 ± 4.2 mmol/L, P = 0.0001; ABF 11.8 ± 4.6 vs. 14.1 ± 5.5 mmol/L, P = 0.0001] (Table 3). Abbreviations: FBG,fasting blood glucose; ABF, after breakfast. aPaired t-test was performed to evaluate the level of significance. bP ≤ 0.05 was considered as the level of significance. Table 4 shows the summary of Chi-square (χ2) analysis between gender and self-care activities before and after the intervention; there was no significant difference between the pretest and posttest results regarding the mentioned variables. bStudent t-test is performed to evaluate the level of significance. cP < 0.05 are considered as level of significance. The total knowledge and attitude scores were compared considering gender; the differences between the variables were insignificant (Table 5). After implementation of the current culture-oriented educational program, a significant improvement was observed in knowledge and attitudes of the patients towards all aspects of diabetes (Figures 1 and 2). Results of the current study were consistent with those of 11 meta-analysis interventional studies, which reported improvement in the knowledge of intervention groups after the implementation of a culturally-appropriate education program (18). Moreover, the changes observed in the values of the study were similar to those of reported in the studies by Naglaa (2010) and Atak (2005) who found marked changes in knowledge and attitudes of patients in Turkey (19, 20). Education and counseling about all aspects of diabetes help patients to well-manage their activities. Group education and individualized education programs play key roles in these changes. It is highly recommended to have regular contact with diabetes educators to improve knowledge, which facilitates the management of patients, although it may not necessarily guarantee improvement in the overall outcomes. In Pakistan, the knowledge of patients referring to the diabetes centers was reported inadequate due to insufficient information, non-availability of educational materials and improper guidance; their attitudes and practices showed the cumulative effect of various risk factors, which led to poor control over diabetes (7). Education is a process that links the gap between patient’s information about diseases and practices. Through providing adequate and sufficient information and guidelines, this tool is likely to have a great effect on the enhancement of patients’ ability to perform self-care activities. Results of a study in Bangladesh showed that 90% of patients with type 2 diabetes, who had basic knowledge on DM, did not test their blood glucose and also did not practice regular extra care of their feet (5). However, the authors of the current study observed an improved scenario after providing the educational messages to the patients. The BADAS guideline instructs to check blood glucose four times a year, and the diabetes educators advised the same through their education program. In the pretest and posttest questionnaires, authors also queried the patients on this issue. The current study observed a significant improvement in monitoring blood-glucose level, performing physical exercise and practicing foot care activities by cross-checking over the diabetes guidebook of patients. Authors also clinically observed body-weight and monitored feet situation in the patients. The results of the current study indicated that the differences occurred in patients knowledge and attitudes towards diabetes, effectively changed the diabetes self-care activities. The improvements, after an educational intervention, were particularly noteworthy among those patients who had extremely poor knowledge and attitudes. The current study finding was similar to that of another study (21). In Pakistan, which reported that the practice of self-monitoring blood glucose (SMBG) was not good, although 50% of the patients had their personal portable glucometers; only 14 of them regularly monitored their blood sugar and the parallel overall exercise pattern in Pakistani patients was also poor. This could be due to lack of knowledge, financial constraint and failure to ensure proper motivation (7). Results of a study in Sri Lanka showed that 40% of the patients were not even aware that regular physical exercise could help them to control their blood glucose level (22). The messages used in the current educational program were developed considering the local context. At the beginning, the diabetes educators explained in Bangla and in a simple way all the important points relating to the diabetes and its management. The posttest results of the present study showed that most (92.1%) patients withdrew smoking; significant changes were observed between the pretest and posttest results in this regard (P ≤ 0.05) whereas 80% of the patients with type 2 diabetes did smoke after achieving basic knowledge (5). A limitation of the present study was that authors used an interviewer-administered questionnaire to assess knowledge, attitudes and self-care activities of the patients with diabetes; many patients commonly report that they gave up smoking. However, authors could not collect any concrete evidence against their statement due to the shortage of manpower and funds. Similar to smoking, consumption of betel nut is also a very bad habit which has a negative impact on patients with diabetes and has no nutritional value. It causes complications such as cancer, cardiovascular diseases (CVD), metabolic syndrome and many other complications. After the intervention, the consumption of betel nuts among patients was almost the same. Over 80% of the patients in the current study were of middle- to upper-middle aged, and in Bangladesh, people in the same age-group are in the habit of consuming betel nuts. Diabetes significantly changes the relationship among patients, their bodies, and the world around them. Restrictions on eating habits make them more aware of their limitations due to diabetes. This is why the conflict between the desire to eat and the imperious need to refrain from indulging in such desire is always present in the every-day life of people with diabetes. At follow-up visits, a 25.5% increase in following the dietary advice of the diabetes educators could be observed among the study patients. However, it was a reality that despite their intention to follow the advice in all aspects of dietary management, they failed. The conflict discussed earlier might be an important element in understanding the patients’ low rates of positive practices to cope with the disease. The diabetes educators, therefore, need to make major efforts to enhance the educational level of patients with type 2 diabetes to promote compliance with recommendations regarding diet. Since the present study was conducted only in 19 healthcare centers and was outpatients-based, the results may not be truly representative of all DM patients in Bangladesh. Another important limitation of the study was that there were no comparison groups and the pretest-posttest study design was used. Thus, further studies are needed in different settings to identify the educational needs of patients and also to identify appropriate methods to improve self-management of diabetes by incorporating a comparison group. Difficulties in motivating patients to continue and complete all activities required during the study restricted the analysis of many variables. Since the interviews were conducted by four interviewers, there might have been subjective variation in recording data too. The results of the study demonstrated that the applied health-education messages were effective tools that implicated a significant change in patients' knowledge and attitude towards different aspects of diabetes. Moreover, monitoring blood glucose, doing physical exercise, taking foot care and quieting smoking significantly changed in the study patients, reflecting the effectiveness of the culturally oriented health-education messages to improve their self-care activities. Based on the findings of the study, it is strongly recommend to put more emphasis on developing appropriate, local culture and ethnicity-oriented health educational messages as an effective tool to bring change in patients' self-care activities. Authors acknowledge their gratitude to their respected colleague Mr. M. Shamsul Islam Khan, the Advisor, Department of Library and In-charge, English Foundation Course, Department of Applied Languages and Culture, Bangladesh University of Health Sciences for his guidance in language editing. Authors also thank the patients with type 2 diabetes who participated in the study. Authors’ Contribution: Farzana Saleh, designing the research, finalizing analysis and interpretation of data, reviewing draft article critically for final approval of the version to be published; Fadia Afnan, data analysis and interpretation, and drafting the article; Ferdous Ara, analysis of data; Shirin J Mumu, analysis of data; AK Azad Khan, revision of manuscript for important intellectual content. All of the above authors read and approved the final manuscript. Funding/Support: This study was funded by the WDF and Diabetic Association of Bangladesh; grant no. WDF06-195.